Instant downloads of all 945 LitChart PDFs (including Dulce et Decorum Est). "Dulce et Decorum Est" is a poem by the English poet Wilfred Owen. Like most of Owen's work, it was written between August 1917 and September 1918, while he was fighting in World War 1. Owen is known for his wrenching descriptions of suffering in war. In "Dulce et Decorum Est," he illustrates the brutal everyday struggle of a company of soldiers, focuses on the story of one soldier's agonizing death, and discusses the trauma that this event left behind. He uses a quotation from the Roman poet Horace to highlight the difference between the glorious image of war (spread by those not actually fighting in it) and war's horrifying reality. 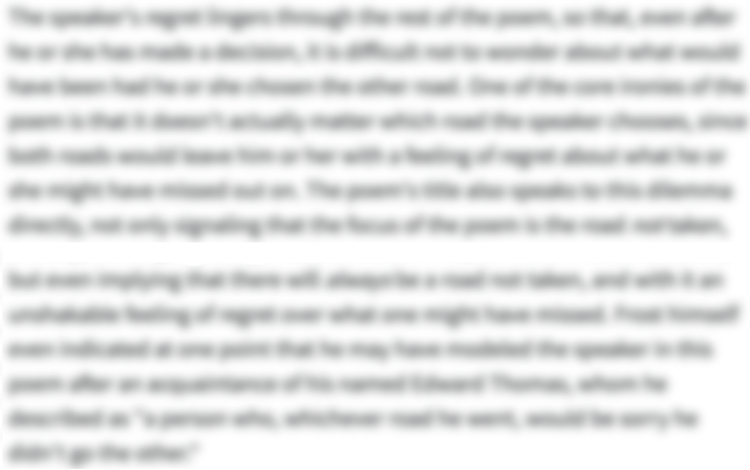 You can read the full text of “Dulce et Decorum Est” here. 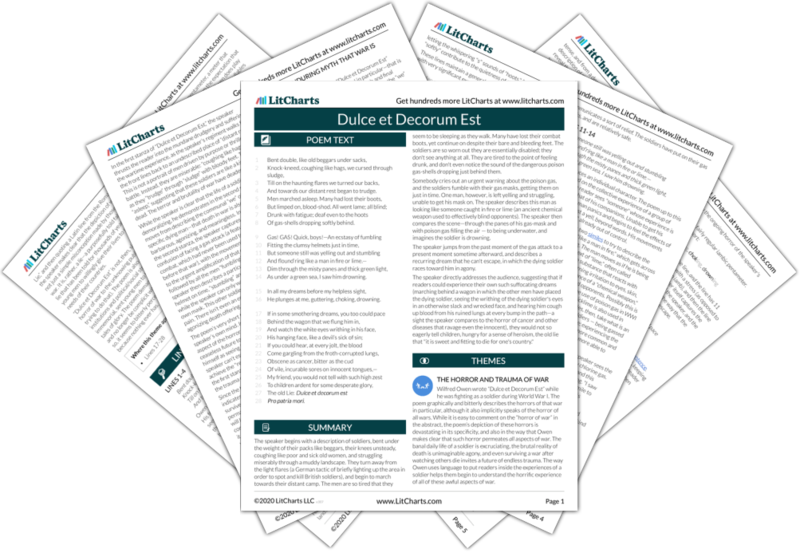 Get the entire guide to “Dulce et Decorum Est” as a printable PDF. Download it! 4And towards our distant rest began to trudge. 8Of gas-shells dropping softly behind. 14As under a green sea, I saw him drowning. 16He plunges at me, guttering, choking, drowning. Unlock all 321 words of this analysis of Lines 1-4 of “Dulce et Decorum Est,” and get the Line-by-Line Analysis for every poem we cover. Unlock all 494 words of this analysis of Lines 5-8 of “Dulce et Decorum Est,” and get the Line-by-Line Analysis for every poem we cover. Unlock all 309 words of this analysis of Lines 9-10 of “Dulce et Decorum Est,” and get the Line-by-Line Analysis for every poem we cover. Unlock all 385 words of this analysis of Lines 11-14 of “Dulce et Decorum Est,” and get the Line-by-Line Analysis for every poem we cover. Unlock all 636 words of this analysis of Lines 15-16 of “Dulce et Decorum Est,” and get the Line-by-Line Analysis for every poem we cover. Unlock all 375 words of this analysis of Lines 17-20 of “Dulce et Decorum Est,” and get the Line-by-Line Analysis for every poem we cover. Unlock all 432 words of this analysis of Lines 21-24 of “Dulce et Decorum Est,” and get the Line-by-Line Analysis for every poem we cover. Unlock all 814 words of this analysis of Lines 25-28 of “Dulce et Decorum Est,” and get the Line-by-Line Analysis for every poem we cover. Unlock all 316 words of this analysis of allusion in “Dulce et Decorum Est,” and get the poetic device analyses for every poem we cover. Unlock all 293 words of this analysis of simile in “Dulce et Decorum Est,” and get the poetic device analyses for every poem we cover. Unlock all 167 words of this analysis of metaphor in “Dulce et Decorum Est,” and get the poetic device analyses for every poem we cover. Unlock all 173 words of this analysis of consonance in “Dulce et Decorum Est,” and get the poetic device analyses for every poem we cover. Unlock all 174 words of this analysis of enjambment in “Dulce et Decorum Est,” and get the poetic device analyses for every poem we cover. Unlock all 259 words of this analysis of repetition in “Dulce et Decorum Est,” and get the poetic device analyses for every poem we cover. Unlock all 306 words of this analysis of apostrophe in “Dulce et Decorum Est,” and get the poetic device analyses for every poem we cover. Unlock all 182 words of this analysis of hyperbole in “Dulce et Decorum Est,” and get the poetic device analyses for every poem we cover. Unlock all 436 words of this analysis of imagery in “Dulce et Decorum Est,” and get the poetic device analyses for every poem we cover. Unlock all 169 words of this analysis of oxymoron in “Dulce et Decorum Est,” and get the poetic device analyses for every poem we cover. Biography of Wilfred Owen — A detailed biographical sketch of Wilfred Owen's life, including analysis of his work. An Overview of Chemical Warfare — A concise historical account of the development of chemical weapons, with detailed descriptions of the poison gases used in WWI. Listen to "Dulce et Decorum Est" — A recording of "Dulce et Decorum Est," provided by the Poetry Foundation. Representing the Great War — The Norton Anthology's overview of literary representation of World War I, with accompanying texts. This includes two of Jessie Pope's patriotic poems, as well as poems by Siegfried Sassoon and others and various contemporary illustrations. It also suggests many additional resources for exploration. Horace, Ode 3.2 — One translation of the Horace ode that the lines "Dulce et Decorum Est" originally appear in. Digital Archive of Owen's Life and Work — An archive of scanned documents from Owen's life and work, including his letters, as well as several handwritten drafts of "Dulce et Decorum Est" and other poems. The White Feather — A brief personal essay about the treatment of conscientious objectors in WWI-era Britain. O'Brien, Liam. "Dulce et Decorum Est." LitCharts. LitCharts LLC, 21 Dec 2018. Web. 24 Apr 2019. O'Brien, Liam. "Dulce et Decorum Est." LitCharts LLC, December 21, 2018. 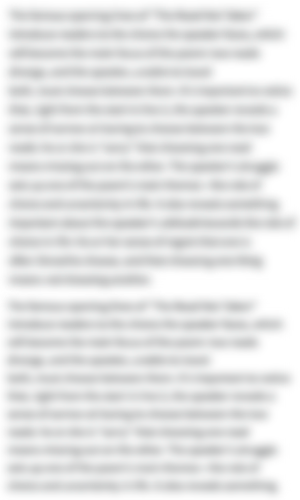 Retrieved April 24, 2019. https://www.litcharts.com/poetry/wilfred-owen/wilfred-owen-dulce-et-decorum-est.